Forty-eighth Regiment, N. Y. V.
Since my last I have been on a visit to Portsmouth [Virginia], and during my absence our regiment [the 48th New York] was in the charge on the Rebel works before Petersburg on the 30th ult. [July 30, 1864], when the Rebel fort was blown up.1 If I had been there I would have written before. Our regiment suffered pretty severely in the fight, and the next day [July 31, 1864] we were relieved and marched to this place; the day was sweltering hot, and numerous cases of sunstroke took place, some of them dying; some twelve or fifteen died from the effects of the sun, others were disabled for a time, and are now returning to their companies. In the fight of the 30th, we lost Major S[amuel]. M. Swartwout, and Lieutenant J. O’Brien, and eight men killed, and thirty wounded; those that were killed were all shot outside of our works, and died while bravely doing their duty. Our Division (Turner’s) [2/X/AotJ] lost as many as the Eighteenth Corps. 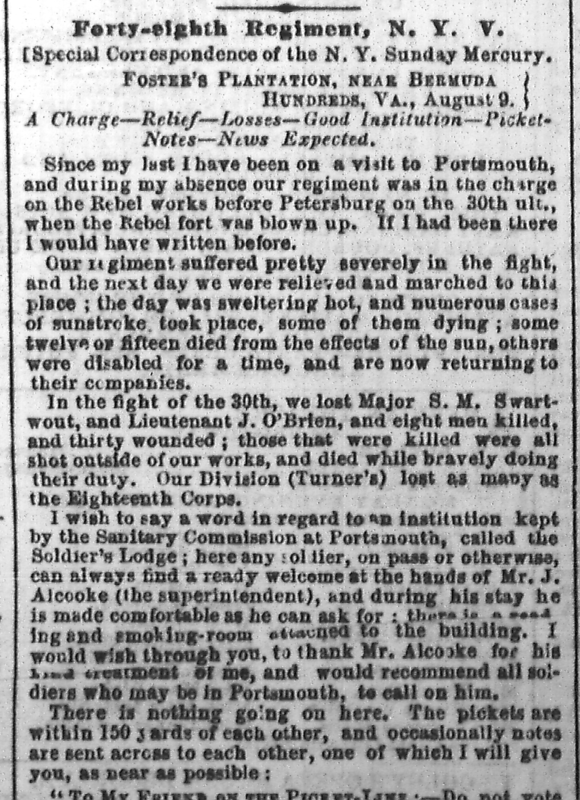 I wish to say a word in regard to an institution kept by the Sanitary Commission at Portsmouth, called the Soldier’s Lodge; here any soldier, on pass or otherwise, can always find a ready welcome at the hands of Mr. J. Alcooke (the superintendent), and during his stay he is made comfortable as he can ask for: there is a [? ]ing and smoking-room attached to the building. I would wish through you, to thank Mr. Alcooke for his kind treatment of me, and would recommend all soldiers who may be in Portsmouth, to call on him. 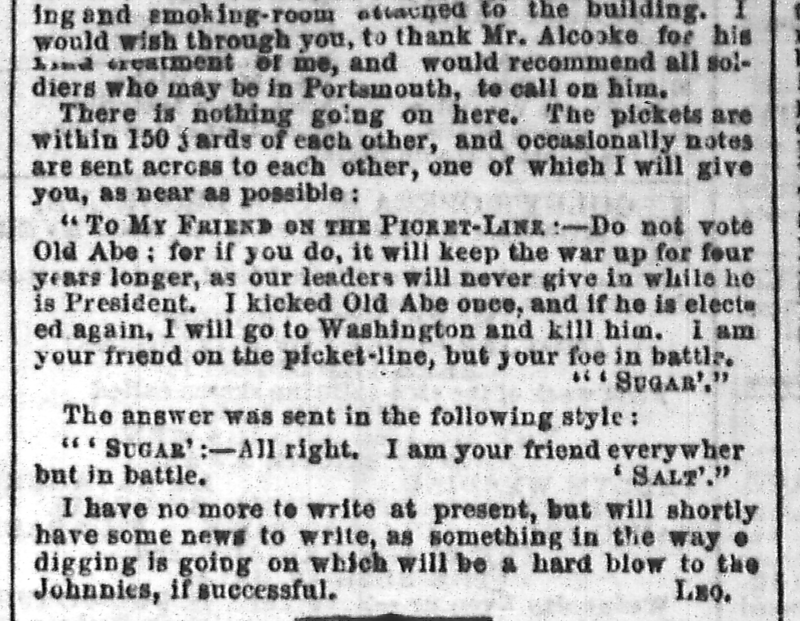 “TO MY FRIEND ON THE PICKET-LINE:—Do not vote Old Abe: for if you do, it will keep the war up for four years longer, as our leaders will never give in while he is President. I kicked Old Abe once, and if he is elected again, I will go to Washington and kill him. I am your friend on the picket-line, but your foe in battle. “’SUGAR’:—All right. I am your friend everywher[e] but in battle. I have no more words to write at present, but will shortly have some news to write, as something in the way o[f] digging is going on which will be a hard blow to the Johnnies, if successful.